Dogs love going on walks. Walking improves your dog’s well-being; it reduces stress, releases energy, builds muscle tone and burns calories. 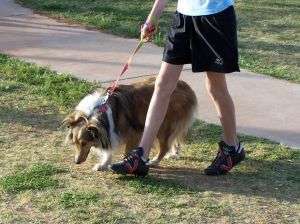 With our busy schedules, walking our dogs is turning into a chore rather than an activity we enjoy and look forward to. Author Lana Rose has uncovered 7 tips to help you improve your dog walks, making them more enjoyable for both yourself and your dog. Don’t go out thinking about what you have to do next or have a conversation on your phone; give your dog your full attention. The walk will be more fun for him if you focus on his needs. It’s a great opportunity for social interaction, burning energy and calories and building a relationship with your dog. It gives something for everyone to aim for, raises money for worthy causes and provides quality time spent together.